SPACIOUS, and EXTENDED semi detached home in POPULAR LOCATION with OFF ROAD PARKING, and offering SPACIOUS 28FT through lounge/dining area, FITTED kitchen, 3 BEDROOMS, bathroom, PLEASANT rear garden. MUST BE VIEWED. EPC rating D.
This is a spacious, extended and thoughtfully improved 3 bedroomed semi detached home, occupying a pleasant position within this popular location, briefly comprising the following accommodation :- On the ground floor is a porch, entrance hall, spacious through lounge/dining area, and extended, fitted kitchen (with oven/hob). First floor provides 3 bedrooms and bathroom. Outside is a drive at the front providing off road parking, and pleasant rear garden with potential garage/useful store at the rear. DG & GCH. VIEWING ESSENTIAL. EPC rating D.
Double glazed bay window to the front, 2 radiators, feature 'log burner' fire, double glazed window and doors to the rear garden. Double glazed window to the side and double glazed window to the rear, radiator, base and wall mounted units, work surface area, circular bowl sink with mixer tap, integral oven, 4 ring gas hob and cooker hood above, integrated dishwasher, plumbing for automatic washing machine, complimentary tiling to the walls, and door to the side. Double glazed bay window to the front providing pleasant outlook, radiator and wooden flooring. Double glazed window to the rear, radiator, and wooden flooring. 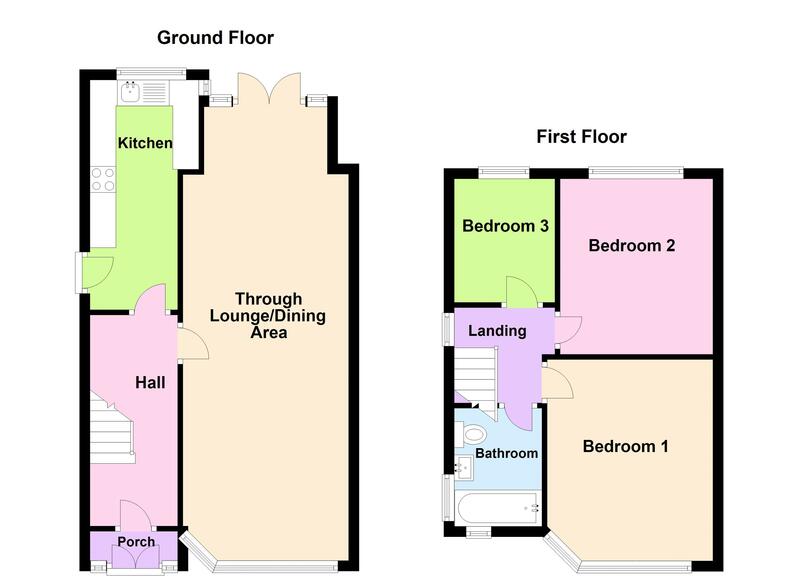 Double glazed window to the front, double glazed window to the side, heated towel rail, and suite comprising :- Bath with shower over, wash handbasin, low level flush wc, and complimentary tiling to the walls. Drive providing off road parking (with electric point), and pathway leads to the accommodation. Pleasant rear garden with patio, lawn, shrub border, and pathway with POTENTIAL GARAGE/USEFUL STORE at the rear of the garden.